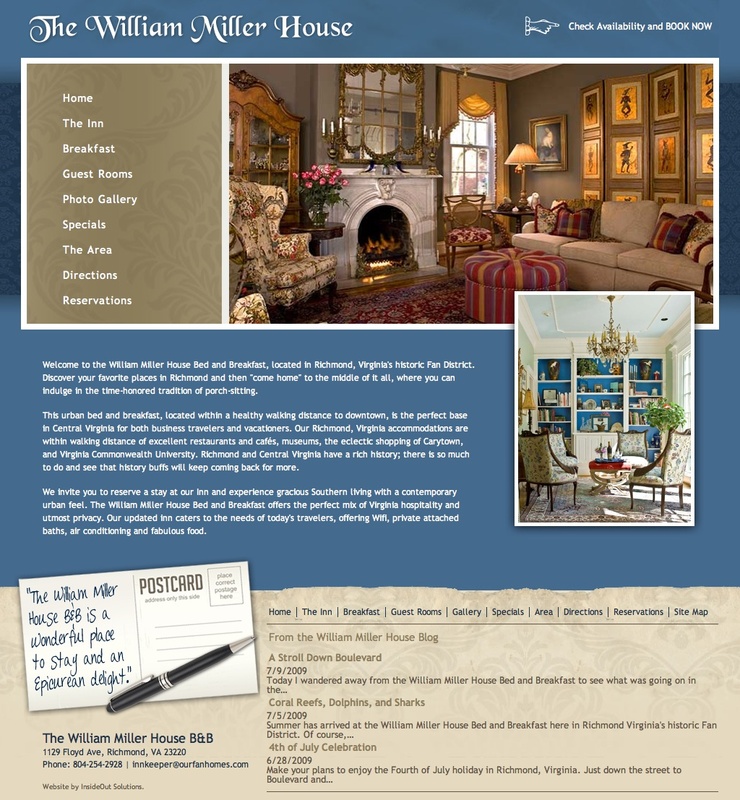 New Web Site for Richmond Bed and Breakfast - InsideOut Solutions, Inc. 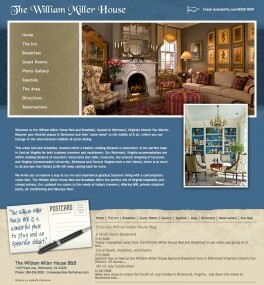 The William Miller House is an elegant property in the historic Fan District of Richmond Virginia. A small Inn in Downtown Richmond Virginia, the innkeepers were looking to invest in a website that was going to be a great tool for them for years to come. With two guest rooms, they are extremely committed to customer service and providing dedicated & intimate care to their guests. Beth Logan, our award winning lead designer, maintained the color scheme of their old site while modernizing the look and internal structure. Of course, all website designs at InsideOut are made with Cascading Style Sheets, and optimized for Search Engine Placement. They have a different style of photo gallery, one that allows them to include descriptions of the photos. When a visitor clicks on the photo, it is pulled into a lightbox for better viewing. The innkeepers of this Richmond lodging are active bloggers, and we made the RSS feed from their blog a prominent section of their footer. Mike has already told us the website has improved his business.Â How can we help you?Â Give us a call at 1-800-500-8401 or fill out our online contact form.